There was just something about this guy. It's been quiet here for the last month, I've been on a trip to the USA, visiting New York City, Washington DC and Boston, there's likely to be an American theme here for the next few posts. This photograph was made in the art galleries district of Manhattan. I'd just visited Aperture and seen James Mollison's playground photographs, and LaToya Ruby Frazier's photographs of her family. Aperture have a great library of their books there, and I had the chance to look through a lot of new books, and was particularly excited to see some out of print books by Robert Adams that I'd not had the chance to see before. I'll be doing a floor talk for my show 'The Line of Lode' at Think Negative Sunday 24th May at 2.00pm, please come along if you're free. I'll be talking about my trip to Broken Hill where the photographs were made, printing in the darkroom, and will have my Arca Swiss 4x5 camera there for a bit of a demo. The show is on the walls, the drinks are cold, and the chips will be out at 2.00pm for the opening of my Head On Photography Festival exhibition 'The Line of Lode'. The photographs were made in Broken Hill, outback Australia, and the surround ing areas with medium and large format cameras, and it's all hand printed on fibre paper. Hope to see you there! It's open weekend, May 10-30 if you miss the opening. The prints have been mounted and spotted, and everything is about done for my Head On Photography Festival exhibition 'The Line of Lode to open on Sunday at Think Negative. Tune in to ABC for this on Tuesday night. Trent Parke: The Black Rose follows the Adelaide-based photographer as he prepares for an exhibition at the Art Gallery of South Australia. The culmination of seven years work, it is the most personal of investigations for Trent Parke. The first Australian to become a full member of the renowned photographers' cooperative Magnum Photo Agency, Parke is considered one of the most innovative photographers of his generation. Whilst working as a press photojournalist during the first years of his career, Parke received numerous awards, including five Gold Lenses from the International Olympic Committee, and World Press Photo Awards in 1999, 2000 and 2005. In 2003 he was awarded the prestigious W. Eugene Smith Grant in Humanistic Photography for his series Minutes to Midnight. The ABC documentary, Trent Parke: The Black Rose, features interviews with Trent Parke’s partner, photographer Narelle Autio, as well as photography critic and writer Geoff Dyer. Trent Parke: The Black Rose screens 21 April at 10pm on ABC. Trent Parke: The Black Rose runs March 14 – May 10 at the Art Gallery of South Australia. Late last year I received an e-mail from Shutterbug asking me if I'd like to partake in an article, they had seen an image of interest and wanted a few words to go with it. When we spoke I was intrigued to find that this was planned for their upcoming mobile photography issue, being primarily a large format photographer, I was a little unsure of how I would fit in. As it turned out, it was my posting of darkroom pictures on social media they liked. I was surprised at first to find how interested people were in seeing wet printing in progress. Perhaps it was a mix of nostalgia from those who have switched to digital, and something new for people who have come to photography with megapixels. From the April issue of USA's Shutterbug, and a photograph of my prints in selenium toner. I was recently asked to write an article for 'The Photograph Explained' series, published on the Large Format Photography Australia site. I chose a photograph from my series 'The Line of Lode', made on the shores of Lake Menindee, in western New South Wales. In September 2014 I left on a road trip to Broken Hill and its surrounding area in western New South Wales. I had wanted to visit the Australian outback for many years; this was my first journey beyond Dubbo. We packed up the car for a quick five day trip of sun up until heat stroke photography, and after a little snooze, continuing photographing on into the evening. I experienced part of Australia very different to my life in Sydney, a community a little less influenced by the rest of the world and the trends of metro areas. This image was made on the shores of Lake Menindee, about 100km south east of Broken Hill. It’s a popular destination and there are many manipulated images on the net with unrealistic colours and mirrored reflections. My approach to photography is simple, to photograph a place exactly as I find it, and to reproduce it in a detailed and realistic way. Bulldozer tracks marked the sand and many trees had been reduced to a pile of sticks. This is what I found, and so this is what I photographed. Human intervention in the environment appears in almost all my photographs, my photographs are built on elements that would often be cropped out to present an untouched landscape. While my subjects are often not beautiful, and perhaps not even particularly interesting to the casual observer, I aim to find form in the scene, and through that, create a meaningful and beautiful image. I design my images upon the geometric elements, emphasising the footprint of society. I used my standard set up to make this photograph, and I rarely use anything else – an Arca Swiss F Metric 4 x 5 camera with 110mm Schneider Super Symmar XL. The Arca is a light weight and reasonably compact monorail camera, it offers the precision of a geared metal camera, with portability similar to a folding camera. The 110mm lens fits the field of view I like to use, and it probably accounts for 90% of my images made on 4 x 5. 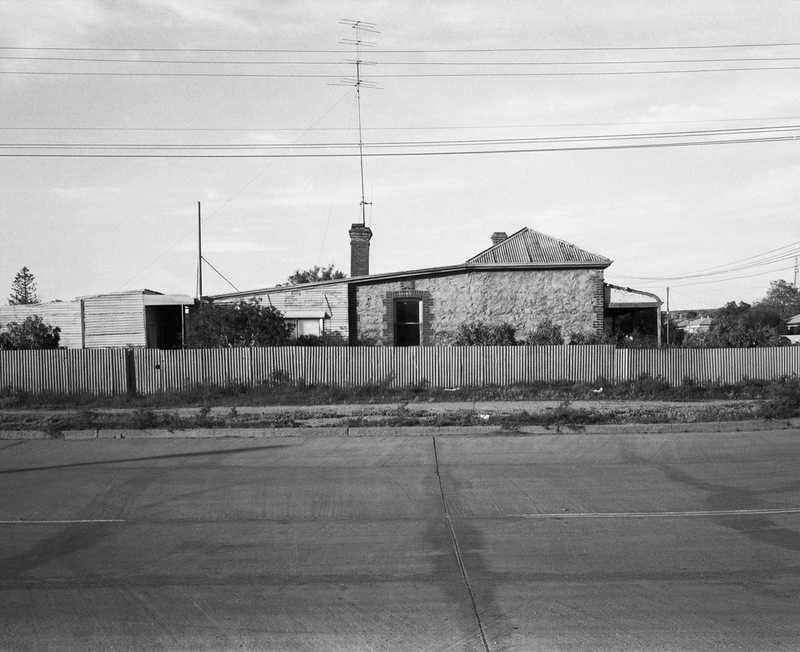 I print at the Think Negative dark room Marrickville on Ilford fibre based paper. I will be exhibiting this image during the Head On photography festival as part of my show ‘The Line of Lode’, at Think Negative in May 2015. As part of the Be / Longing show at Gaffa Gallery, I'll be doing an artist talk at 3.30pm on Saturday March 21. I'll speak about the pictures, a little about my practice, and of course, answer any questions from the floor. I've just got back from installing a show at Gaff Gallery. It opens 19 March (that's tomorrow!) and is a group show on the theme of longing and belonging. I had a quick peak at the shows in the other rooms at Gaffa, and they look interesting too. I'll be doing an artists talk at 3.30pm on Saturday March 21. From a relationship between two people to a connection to a home you have moved away from, the exhibition be/longing brings together a group of photography and video artists whose work examines the ache, the feel and the desire of longing. I was in Canberra recently and dropped in at Sean's place for a cup of tea and some cake. After the rain stopped, we went out wandering.